Pollination occurs naturally outdoors, where wind and insects carry pollen from one flower to another to fertilise them and set fruit. 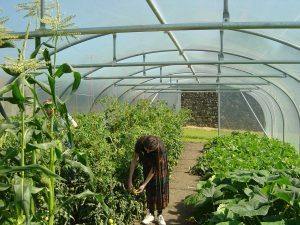 Tunnels and glasshouses shelter plants from wind, and fewer insects go inside so natural pollination is sometimes not enough to set a full crop of fruit. 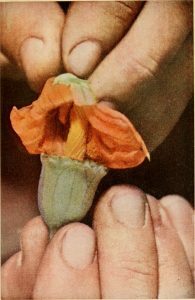 Incomplete pollination of a flower can produce a fruit that only develops and grows on one side while the other side remains hard and misshapen. This can be a problem with strawberries. Peaches, nectarines, grapes, melons and aubergines among others can yield better with help. Hand-pollination is the answer. 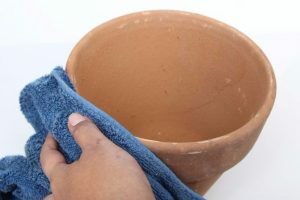 When the first flowers are just fully open and conditions are dry, brush over the flowers gently with a very soft brush or a little cotton wool. In the past gardeners used rabbits’ tails, but animal welfare was not a consideration then. Paintbrushes are a bit too stiff for pollination, but the likes of a camera lens brush is perfect. Never use one on a lens afterwards, because it picks up oils from pollen that would smear the lens. Pollen grains have spines for gripping onto hairs such as on bees’ bodies, and they brush off onto the sticky stigmata of other flowers – job done. It is best to repeat for a few days running to ensure good pollination and catch the later flowers. Tomatoes are easy to pollinate by vibration; tap on the flower trusses or the supporting canes or wires, or water them from above with a coarse spray of water. 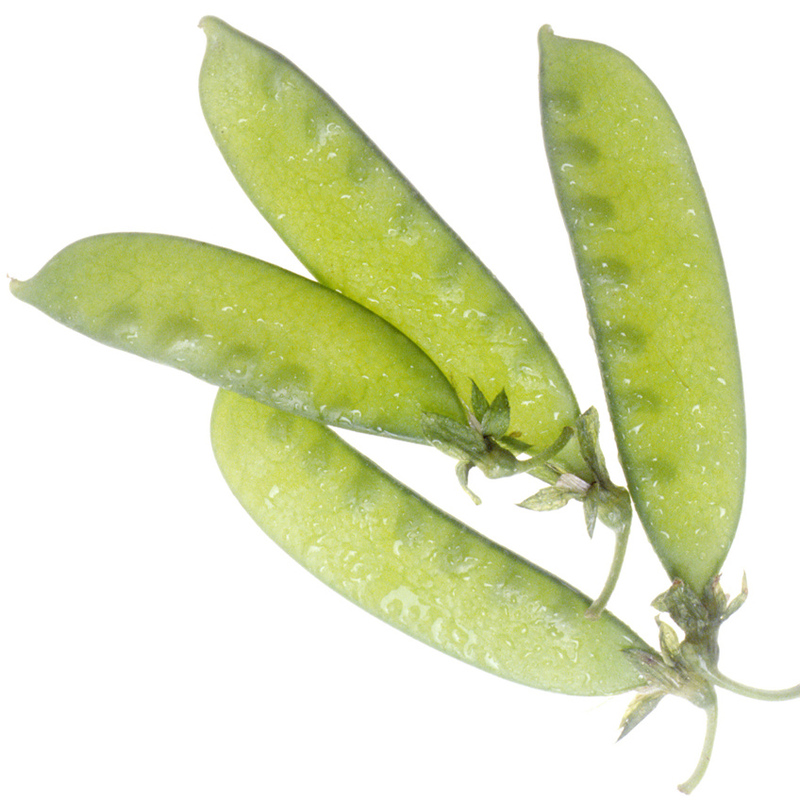 We associate mangetout peas with early summer, but you can harvest them from April onwards if you sow them now. They are surprisingly hardy. Sow about four seeds of ‘Oregon Sugar Pod’ or any other variety in four-inch (10 cm) pots of good compost and place them in your tunnel or glasshouse. Protect them from mice until they germinate, and from slugs thereafter. 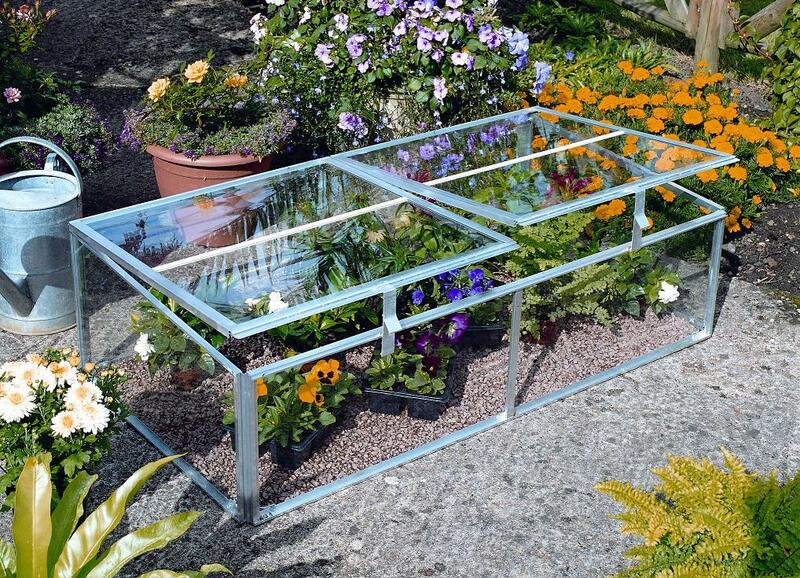 Don’t water them too heavily, and keep them covered with bubble-wrap or fleece at nights to speed up germination. Plant them into a composted trench in the border soil when the plants are about 3” (8 cm) tall. Push in short pea-sticks on either side of the row to support the plants and keep their growing tips off the soil surface, where slugs would eat them. Ventilate well during the day to reduce mildew infections. Cover over the rows at night with fleece or bubble-wrap to protect them on very cold nights. Add in longer pea-sticks if the plants need them. The plants should be ready to flower by April, and generous watering and some feed will help boost yield. Harvest the pods often to keep the plants flowering. You can sow a second, later crop to extend cropping until the outdoor crop comes in. Enjoy! Mibuna is a traditional Japanese green crop, ideal for greenhouses in winter. Like mizuna, it is a member of the cabbage family and produces green leaves for salads and cooking over a long period. It is grown in much the same way. 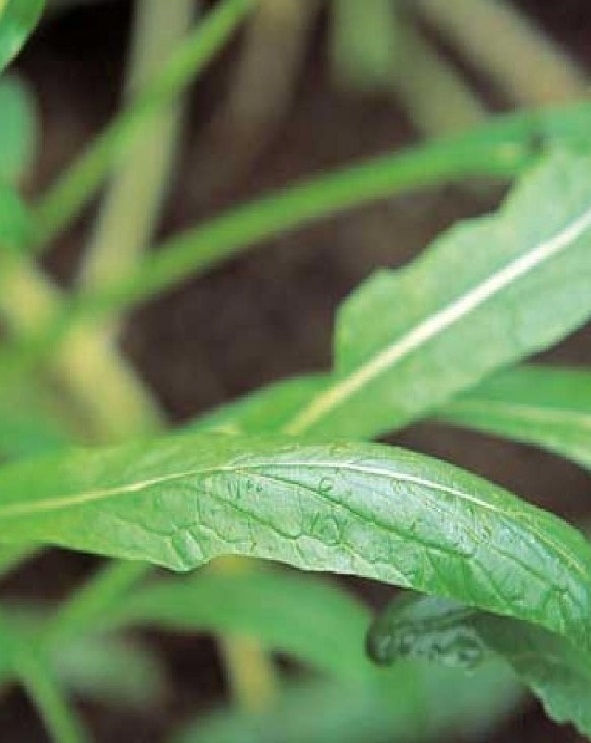 It is less hardy and productive than mizuna, but its narrow strap-like leaves (often with a white midrib) have a more spicy flavour that gardeners enjoy and some slugs don’t (though some like it hot). 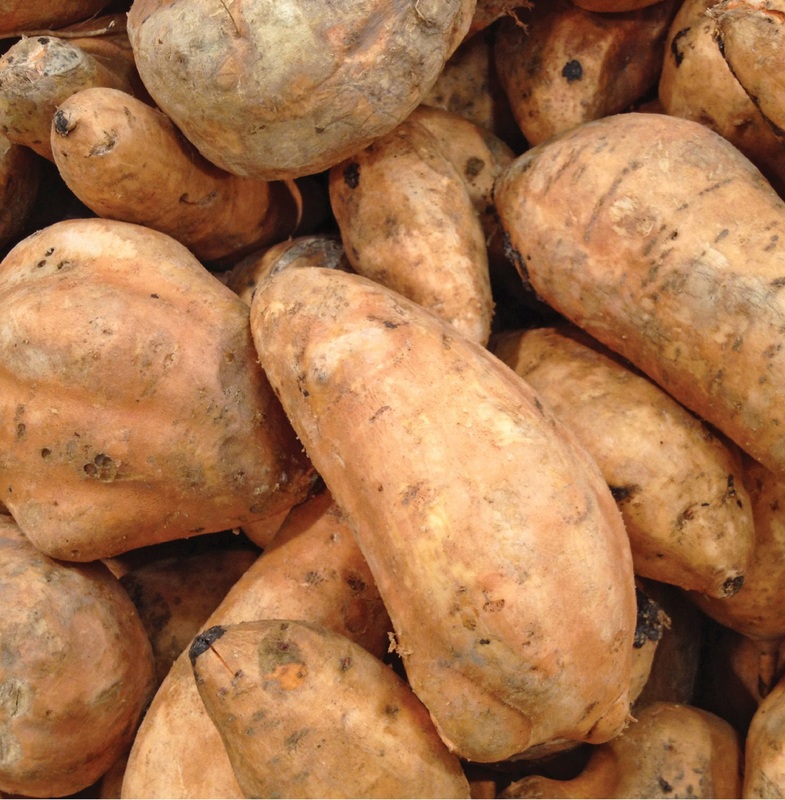 It can be harvested as whole plants, but excels as a cut-and-come-again crop. Seed sown now in containers or borders can produce leaves from October to April or May next. Add in plenty of compost, and sow seed thinly in drills 1cm deep. Border rows should be about 30cm apart. Keep the soil moist: dryness encourages bolting, especially in spring-sown crops. Watch out for flea beetles and slugs. 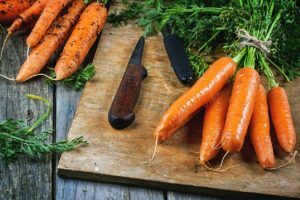 Cut off and compost overgrown leaves and any flowering stems that appear; it diverts the plant’s energy into growing more fresh leaves. Use leaves while they are still young. Eat them raw in salads or lightly steamed or pickled. The Polydome Display Area with most snow removed from roofs in advance of the promised blizzard. 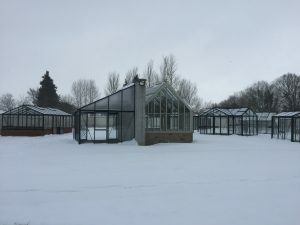 As the whole country is bracing itself for the ‘Beast from the East’ we would like to advise customers with Polytunnels and Glasshouses that once it is safe to venture outside you should remove snow as it is surprisingly heavy and can collapse structures if allowed to build up excessively. If you have an electric heater for use in Greenhouses (specially sealed for a wet environment) you could leave it running as the warmth may help to melt snow before it has a chance to build up. If you have a direct fired heater – e.g. a gas heater that works like a gas hob inside a metal cover, only leave it running if you can be positive that there is a fresh air supply to it that will not get blocked (otherwise it will burn up all the oxygen and produce carbon monoxide with potential disastrous consequences). Any number of ways (such as soft bristled brushes, sheets, mop handles etc.) can be used to dislodge snow but whatever you choose try not to damage your polythene or glass in the process, so use something soft so that it will not scratch (causing reduced light transmission) or tear the cover or break the glass. 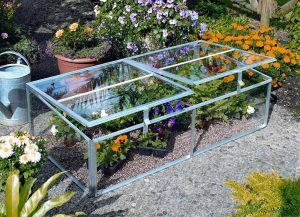 It is also possible to prop the roof inside your Greenhouse or Polytunnel, but of course this should be done before snow builds on your structure in case it could collapse while you are in there. We hope that everyone will be safe and well which is the most important thing, your Greenhouse or Polytunnel can always be replaced – and you may even have insurance to cover it, but of course it is not worth taking any risks to protect it. 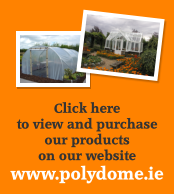 We at Polydome would like to wish all our customers, friends and suppliers a lovely Christmas and offer our best wishes for the coming New Year. We will be closing on Saturday at 1pm and reopening on Tuesday 2nd of January at 9am.